Stress is definitely not a pretty thing. Between school and work and physical therapy appointments, I slowly let it get overwhelming. And when stress kicks in, stress-eating is usually quick to follow. I've always been good at maintaining my gluten free meals, but avoiding some of the other foods that I know make me sick isn't always as easy. So I was slowly letting in more and more junk and letting stress take over which meant my psoriasis started flaring up and got the worse that it's ever been. I had chunks of hair falling out. You can always imagine how traumatizing that can be, but let me tell you, I never really knew until it happened. The look of horror I saw in the mirror—I wouldn't wish it on anyone. I finally decided I had to make some changes. 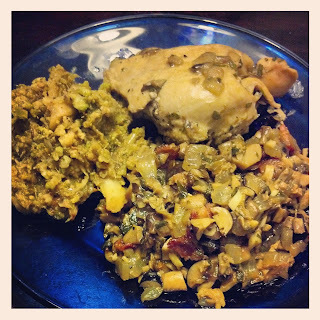 I started the Autoimmune Protocol (also known as Autoimmune Paleo) five days ago. The AIP is 30 days of strict limitations: in addition to no grains, legumes, sugars, and vegetable oils, there is also no nuts, seeds, nightshades, eggs, dairy, NSAIDs, coffee, chocolate, and alcohol. The charts that I am following can be found on Autoimmune Paleo. This means that for the next 30 days ALL of my recipes will be AIP-approved for the elimination stage of the protocol. Let's go! In a cast iron skillet preferably, cook bacon slices until super crispy. Remove bacon slices, crumble, and set aside. In still warm bacon fat on medium low heat, add onion and allow to cook most of the way through until mostly translucent. Turn heat to medium high and add mushrooms, garlic, and herbs. Saute 2-3 minutes. Then add chicken broth and salt. Allow to cook at medium high until most of the broth cooks off and condenses. Add bacon crumbles and mix thoroughly. Serve! *Feel free to also throw everything into the food processor except for the chicken broth. Then you can throw everything into the pan at once. I prefer softer onions so I didn't go with this option, but it's there if you're in a hurry. **You can also reserve the liquid and use in place of the chicken broth if you prefer. I used chicken broth because of its healing properties. It's good for your gut!